A real man would be __________ of doing that. Are you __________ for having lied? Aren't you __________ of yourself, a grown man in tears! Can you believe that I was __________ when I was a kid? Don't be __________ of being poor. He acts very __________ in her presence. He changed from a __________ person into quite a politician. He is __________ of being idle. He is __________ of his failure. He is __________ for asking such a stupid question. He is not __________ of begging. He is __________ but brilliant. He loves her very much, but he is too __________ to talk to her. He was a very __________ boy. He was __________ of his ignorance. He was __________ at first. His words of praise __________ me. I am __________ to appear in public. I am __________ to show my face. I am __________ about failing that test. I am __________ by debts. I am __________ that I had forgotten about that. I am more __________ than I am quiet. I am really __________ of myself. I am __________ and timid. I am so __________ I could cry. I feel __________ of having lost my temper. I feel so __________ for cheating on the test. I felt __________ by the excessive praise. I must admit to feeling __________. I was an intensely __________ kid. I was __________ because he kept staring at me. I was __________ by his bad manners. I was __________ by what she said. I was __________ that I didn't know the name of the prime minister. I was so __________ that I left the party quickly. I'm __________ because I acted foolishly. I'm __________ to look you in the face. I'm __________ that I can't write in English. Jane was really __________ because she spilled her drink on her boss. John is __________ that he cannot sing well. My children are __________ of strangers. My son is very __________. Our son is never __________ in front of strangers. She appears to be a little __________. She is more __________ than cold. She is __________ and talks little. She was __________ of her children's behavior. That girl is far from being __________. The revelation __________ the administration. The __________ student lingered in the corner. The students in this school are very __________. The therapist drew out the __________ girl. Unlike Hanako, I am innocent and __________. You have no need to be __________. You ought to be __________ of yourself! You should be __________ of your folly. You should be __________ of yourself! A monkey is climbing up a _______ tree. Fried foods are _______ in fat. I got a _______ score on the test. It is 301 meters _______. It is comical to see a short man in a _______ hat. She is wearing _______ heels. Some players are as _______ as two meters. Superman is able to leap _______ buildings. Symptoms of that are _______ fever, stuffy nose, and diarrhea. That _______ tree is about 100 years old. The birds are flying _______ in the sky. The ceiling is very _______. The horse is so _______ that I can not mount him. The Merkel doll is 46 centimeters _______. The museum is at the foot of that _______ tower. These falls are 30 ft. _______. They are 8.4m _______, gigantic wooden statues. What a _______ mountain that is! What a _______ building that is! He held the post ______ 1897. He kept sleeping ______ evening. He served there ______ he died. I cannot wait ______ next week. I drew pictures ______ the evening. I had to arrive at the office ______ 10am this morning. I had to finish the work ______ yesterday. I have to return this DVD to the rental store ______ Wednesday. I slept from 8AM ______ 1PM. I want an answer ______ tomorrow morning. I want that ______ today. I want to retire ______ the end of this month. I was on vacation ______ yesterday. I will contact you ______ tomorrow morning. I will not fail to have it ready ______ tomorrow evening. I will pay ______ the end of today. I will sleep ______ 10pm. I'll stay here ______ ten. I’ll be here ______ three o’clock. I’m staying in London ______ October 5th. It had been good ______ now. It will be ready ______ six this evening. Let's wait ______ six o'clock. Memorize the poem ______ next week. Mr. Smith should have left Tokyo ______ yesterday. Mr. Smith was staying in Tokyo ______ yesterday. Please finish the report ______ Friday. Please reply ______ the end of the day today. Please send that ______ today. Please stay there ______ Friday. Soak seaweed in water ______ tender. The meeting lasted ______ 5. The wind will die ______ evening. They will be finished ______ the end of the year. This boom continued ______ around 2005. We have school ______ four o'clock. Well, good‐bye ______ we meet again. Will that be finished ______ today? Will a Major Earthquake Happen Again? ​Last December the Headquarters (1_________) Earthquake Research Promotion announced that in all likelihood an earthquake (2_________) a seismic intensity of a weak six on the Japanese scale (causing heavy furniture to shake or fall down) will occur (3_________) the next 30 years. Whenever a major earthquake occurs (6_________) Japan, there are many fatalities. When the Great Kanto Earthquake (M 7.9) occurred (7_________) September 1, 1923, over a hundred thousand people were killed or went missing. When the Great Hanshin Awaji Earthquake (M 7.3) occurred (8_________) January 17, 2005, there were over 6,000 fatalities. When the catastrophic Great East Japan Earthquake (M 9.0) occurred (9_________) March 11, 2011, there were over 20,000 fatalities – (10_________) those who went missing. However, the memory of these huge disasters is apt to fade (11_________) time. Young people in the areas affected (13_________) the Hanshin Awaji Earthquake and the Great East Japan Earthquake communicate (14_________) each other, and through telling their stories are actively conveying information about how to deal (15_________) future tragedies. Within Japan a variety of preparations for dealing (16_________) earthquakes are being carried out. When an earthquake occurs television or radio programs are suspended or captions are run (17_________) a loop on the screen to convey information about the epicenter and the scale (18_________) the quake. Furthermore cell phone alarms go (19_________) to alert people to the emergency and to convey information. 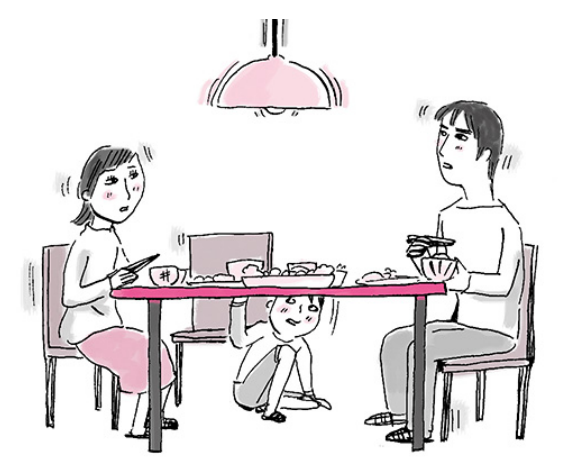 Municipalities publish earthquake countermeasure manuals (20_________) Japanese and foreign languages on their websites and distribute maps (22_________) nearby shelters to residents. In spite of this, (21_________) great disasters seldom take place and are limited to particular areas, people have a tendency to neglect earthquake countermeasures. It's fundamental to know that fires should be extinguished and that to be sure of being able to escape (22_________) the street, doors and windows should be left open, outside it's important to look out (23_________) falling debris. ​At Jigokudani Yaen-Koen (Monkey Park) in Nagano Prefecture there are macaque monkeys known (1______) their habit of bathing in hot springs. Visited (2______) tourists the world over, there macaques are called “snow monkeys” in English. The Park has some rules (3______) visitors. Feeding the monkeys is forbidden because they can attack tourists (4______) food. Touching (5______) monkeys and prolonged eye contact isn't allowed either because they will become wary. You can bring neither dogs (6______) cats with you. The monkeys are unafraid of humans and aren't bothered by tourists' excited cries (7______) flash photography because visitors have always followed these rules. The monkeys (8______) Jigokudani used to flee as soon as they saw humans. (9______) those days, some locale tried to exterminate them because they were running amok in fields (10______) their habitat was lost to mountain and forest development schemes. Couldn't there be (11______) way to protect the farms and people's livelihoods, while also protecting (12______) monkeys and their environment? Those who thought this way tried to keep the monkeys from going (13______) the farms by creating a feeding site in Jigokudani far from any human habitation. At that time Jigokudani was a small resort town (14______) only one old inn and a vigorous hot spring. If its monkeys, its un-spoilt natural habitat and hot springs were turned (15______) tourist attractions, the municipality would reap (16______) economic benefits. This idea, which predated the emergence (17______) ecotourism, kick started the effort to get the monkeys used (18______) humans. With help (19______) the inn, the locals successfully fed the monkeys and five years later (20______) 1964, the park opened. The monkey bath was created after baby monkeys started playing (21______) the open-air bath of the spa inn – that had been lending its support (22______) the park. 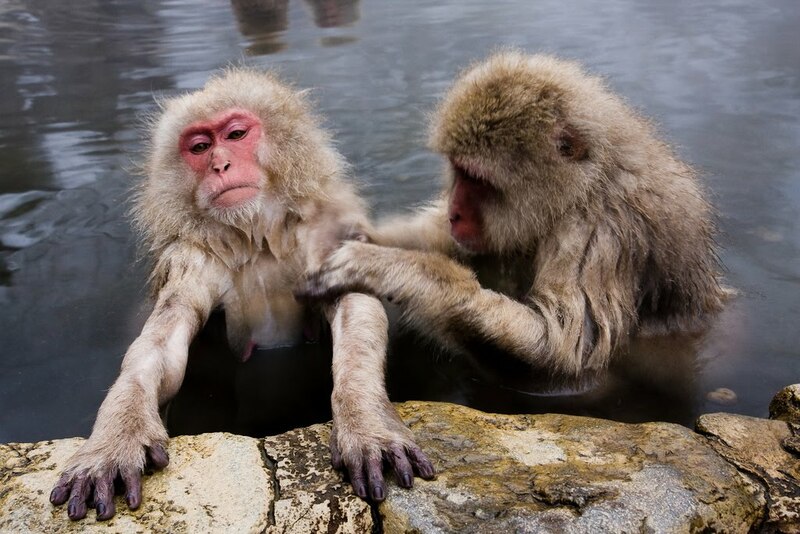 Today, the park has open-air baths (23______) the monkeys where many of them bathe (24______) cold days. People visit (25______) droves to take pictures. In this way, photos taken there have won prizes both in and (26______) Japan and created quite a buzz. In recent years this has led to an increase (27______) the number of winter visitors and foreign tourists. Though some might think the park is a winter attraction, it's actually open (28______) the year. It's not only (29______) tourists, but is also an institution for education and research. In the spring, baby monkeys are born one (30______) the other. Their hair is still black and you can witness the charming spectacle of suckling babies cradled (31______) their mother's arms. In the summer, you can see them enthusiastically playing around, independent (32______) their mothers. As records (33______) the name and mother each and every monkey covering the past 50 years have been kept (34______) the park, university researchers visit for fieldwork from within and (35______) Japan. The park is also used by elementary and junior high school students (36______) outdoor classes. To get to the par, it's a two-kilometer half-hour walk (37______) a mountain trail from the dedicated Monkey Park parking lot. Hiking clothes will therefore be necessary and you'll need to prepare for cold temperatures (38______) wintertime. ​Shiga Prefecture has a lot to boast (1________). 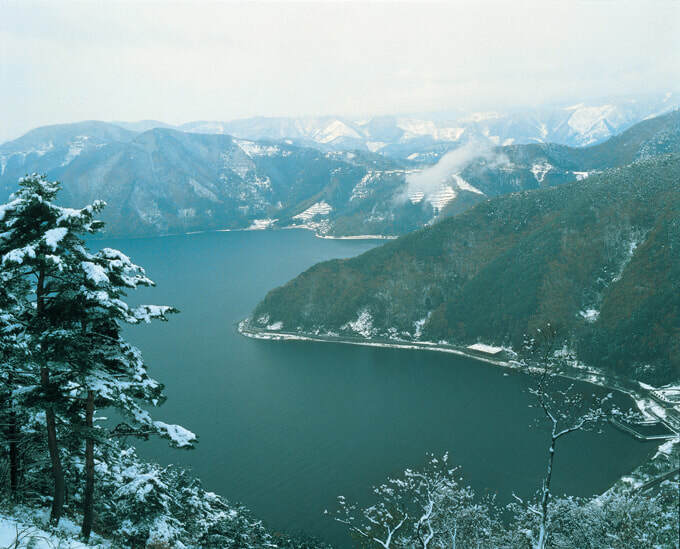 Not only does the area treat visitors (2________) fine food and a collection (3________) impressive historical sites, it also lays claim (4________) the largest lake in Japan – the stunning Lake Biwa. Many people visit Lake Biwa to enjoy leisure activities such (10________) swimming and boating. You can also sail (11________) the lake on a cruise ship. A short course covering only the southern part (12________) the lake and a course around the northern par, featuring Chikubushima, a small island (13________) the lake, are also popular. 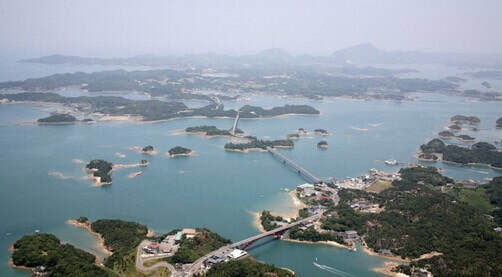 Being rich in nature thanks (14________) the lake and its rivers, Shiga Prefecture produces delicious food. In particular, fish called ayu (sweetfish) and funa (carp) are local specialties (15________) the prefecture and can be enjoyed grilled and sprinkled (16________) salt or as sashimi. But ayu is also tasty as “tsukudani,” where the fish is boiled (17________) soy sauce and sugar. This is very popular as a souvenir. Funa, (18________) the other hand, is often enjoyed as “funa zushi,” a local specialty (19________) Shiga Prefecture, in which the fish is pickled (20________) a mixture of rice and rice kouji (made by fermenting nuka or bran from polished rice (21________) fungi and other bacteria). Since this dish has a strong smell, however, some people don't care (22________) it. Otsu City, where the prefectural government office is located serves (23________) the gateway to Shiga Prefecture. Since Otsu City is only a 10-minute train ride (24________) Kyoto, many people visit the city while touring Osaka and Kyoto. Boat trips (25________) Lake Biwa start from Otsu Port located in Otsu City. Traveling (26________) train for one hour from Otsu City takes you to Hikone and Nahama cities, where a number (27________) historical sites are situated. Nagahama Castle (28_______) the northern part of the prefecture, was built (29_______) Hideyoshi Toyotomi in 1576. A follower (30_______) warlord Nobunaga Oda, who tried to dominate Japan, Hideyoshi succeeded in ruling Japan (31_______) Nobunaga's death. The tenshukaku, the highest part (32_______) the castle which also serves as an observation tower, has been restored as a history museum. Also, the grounds of the castle have been developed (33_______) Hou Park, which is a place of relaxation (34_______) locals. The road running north-south (35_______) the town of Nagaham used to be called the Hokkoku Kaido, connecting Gifu and Shiga prefectures. It was an important road that was busy (36_______) travelers. In the Meiji period (1868-1912), a bank (37_______) black walls was built along this road. Today, old stores stand in a row (38_______) this area known as “Kurokabe Square,” a part of an effort to preserve the traditional landscape (39_______) both the late Edo and Meiji periods. Driving west from Nagahama (40_______) about 20 minutes, you can get to Hikone City, where you'll find Hikone Castle. The castle is also a 10-minute walk (41_______) JR Hikone Station. The tenshukaku of Hikone Castle is designated as a National Treasure and famous (42_______) its beauty. The 15th lord (43_______) the castle, Naosuke II, became the Tairo(Great Elder) of the Tokugawa Shogunate (44_______) the late Edo period and led Japan to end its isolation (45_______) the outside world. However, he was eventually assassinated (46_______) people who were opposed Japan opening its borders to the outside world. The town that flourished (47_______) Hikone Castle is now a busy shopping district called Yume Kyobashi Castle Road, where you'll see many shops selling Japanese sweets and folk crafts. The street is lined (48_______) buildings with white walls and black wooden lattices, a scene reminiscent (49_______) the Edo period. Here, even banks have been built in a way that allows them to blend (50_______) with the surrounding landscape. There were many other castles (51_________) Shiga Prefecture. The stone walls for these castles were constructed (52_________) a tribe of people called “Ano-shu.” Ishiku (stone masons) living in Otsu City, Shiga Prefecture, built stone walls (53_________) Hiezan Enryaku-ji Temple. It is said that Nobunaga set fire to the temple (54_________) 1571, killing not only priests, but also children. (55_________) the temple was burned down, its stone walls didn't collapse. This led Nobunaga to call upon stonemasons (56_________) the Ano-shu guild to work as construction workers when building Azuchi Castle. Until then, castles (57_________) Japan had neither high stone walls nor a tenshukaku; instead most of them only had low stone walls and mounds (58_________) dirt. But after Nobunaga built high stone walls and atenshukaku (59_________) the first time, many new castles followed his lead. In building those castles, the Anoshu were recognized (60_________) their great skills, and were requested to build stone walls (61_________) the country. The precincts (62_________) Hieizan Enryaku-ji Temple cover the entire area of the 848-meter Mount Hiei, which lies (63_________) the border between Shiga and Kyoto prefectures. Originally, the temple was an iori (a small monastery for Buddhist monks), founded (64_________) 788 by Saicho, who introduced the Tendai-shu (a school of Buddhism) to Japan. However, it later became a large temple (65_________) many monks came to live there. The main hall (66_________) the temple, Konpon Chudo, designated as a National Treasure, houses “the Fumetsu no Hoto” (Everlasting Lamp), which has been continuously burning (67_________) 1200 years attracting numerous visitors. Historically, it was known (68_________) a temple to protect Kyoto, where Gosho (the Imperial Palace) was once located. On their way to Kyoto, the site (69_________) the former capital, many people used to travel (70_________) Shiga Prefecture. Still today, the road used (71_________) those days remains, with rows of houses standing (72_________) the surrounding areas. Shiga Prefecture also has some of the bedroom suburbs (73_________) people working in neighboring Kyoto and Osaka. Shiga Prefecture has good access (74_________) public transportation, with JR Otsu Station only two hours away (75_________) train from Kansai International Airport or Osaka International Airport (Itami Airport). From Tokyo it takes three hours (76_________) bullet train, with a transfer at Kyoto Station. Nagoya, Aichi Prefecture, is the fourth most populous city (1_______) Japan after Tokyo, Yokohama and Osaka. It is located (2_______) the Chibu region, a region situated right (3_______) the center of Japan’s main land mass. Nagoya is also the political, economic and industrial center (4_______) this region. Driving northeast (5_______) about ten minutes from Nagoya Station, you arrive at Nagoya Castle, which is the most famous tourist spot (6_______) Nagoya. It was built (7_______) 1612 on the orders of Ieyasu Tokugawa, the first shogun of the Tokugawa family, who ruled Japan (8_______) the Edo period. Its tenshukaku (the castle’ s tallest and most central building (9_______) rooftop views), which as an observation deck on its roof, was burned down (10_______) the Second World War, but was later rebuilt. The entire area, including Nagoya Castle, is known as Meijo Park and is familiar (11_______) the city’s citizens. The symbol of Nagoya Castle is a pair (12_______) Golden Shichihoko (tiger-headed dolphin) statues facing each other (13_______) the roof of the keep. They were said to have been about 2.7 meters high (14_______) the time they were constructed and around 200 kilograms (15_______) solid gold was used to make them. Currently, the inside of the keep serves (16_______) an exhibition space. On the top floor, there is an observation room which as panoramic views (17_______) Nagoya City. Tokugawa Garden, a ten minute drive east from Nagoya Castle, used to be home (18_______) the Tokugawa family. Built (19_______) a huge plot of land, this Japanese garden features a number (20_______) small hills and ponds. From mid (21_______) late April, about 1,000 peonies blossom, and from late May to early June, some 1,700 irises are (22_______) full bloom. Southwest of Tokugawa Garden is Sakae, one (28_______) the main commercial districts of Nagoya. Numerous shops and restaurants are found there, not only (29_______) street level, but underground as well. Rising (30_______) Hisaya Ohdori Kouen, which stretches north to south through the center (31_______) Sakae, is Nagoya TV Tower. The tower is 180 meters tall and has observation decks at 90 meters and 100 meters (32_______) ground level, which command spectacular views. A 15-minute walk to the south from Sakae takes you (33_______) Osu Kannon Temple, one of the three major Kannon temples (34_______) Japan. The temple was moved there from Gifu Prefecture (35_______) 1612, when Nagoya Castle was built. The main hall was burned down (36_______) World Was II and was reconstructed in 1970. (37_______) the 18th and the 28th of every month, the temple grounds are crowded with traders who come from all (38_______) Japan to sell antiques, used goods and second-hand clothes. Many people visit (39_______) temple to enjoy this event. Many bustling shopping arcades catering (40_______) temple visitors are located around Osu Kannon. With its numerous stores selling second-hand clothing and electrical goods, the streets have an atmosphere that combines the feel (41_______) Tokyo’s Asakusa and Akihabara districts. (42_______) recent years, the numbers of tourists from overseas have increased. Because of the covered roofs, you can wander (43_______) the streets without worrying about the weather. In mid-October (44_______) year, the Osu Dai-choin Matsuri (The Osu Street Performers Festival) is held, and a gorgeous “Oiran Dochu” (a procession of courtesans) parades (45_______) the shopping streets. About four kilometers south (46_______) the Osu area is Atsuta Jingu where the temple buildings cover a huge area (about 200,000 square meters) and the grounds include sacred woodland. The historic shrine houses a holy sword which is one (47_______) the Three Sacred Treasures of Japan (the mirror, the sword and the jewel) that have been passed down (48_______) Emperors through the ages. In the shrine’s treasure hall, a collection of about 6,000 objects are (49_______) display. (50_______) the first few days of each year, many people visit the shrine to make wishes (51_______) the New Year. (52_______) the hilly area to the east of the city is Higashiyama Zoo and Botanical Gardens. This zoo is famous (53_______) having become the first zoo in Japan to keep koalas. The botanical gardens have Japanese gardens and greenhouses where some 7,000 kinds (54_______) plants are grown. The Port of Nagoya Public Aquarium, located (55_______) the Port of Nagoya, is the ideal place to get a closer look (56_______) marine life. There you can get your photo taken (57_______) a life-size replica of the the killer whale. Located (58________) the site where the Toyota Motor Corporation was originally established. The museum consists (60________) the Textile Machinery Pavilion, the Automobile Pavilion, Technoland, the Toyota Group building and other attractions. Various exhibits and demonstrations provide easy-to-understand explanations (61________) the manufacturing process. There is also a corner where you can make a cell phone strap or a key chain free (62________) charge. (63________) recent years, Nagoya-meshi has caught the public imagination. Nagoya-meshi refers (64________) dishes that use ingredients and cooking methods unique (65________) Nagoya which cannot be found anywhere else. The dishes include miso nikomi undon and miso katsu, which both use miso (a thick paste made (66________) fermenting rice, barley and/or soy beans) with a richer taste. Other dishes include tebasaki, hitsumabushi, tenmusu, and kishimen. Miso nikomi undo is udon (thick noodles) served (67________) an earthenware pot; people use the lid of the pot as a plate (68________) eating it. Miso katsu is a port cutlet served (69________) miso sauce. Tebasaki is deep fried chicken wings coated (70________) a special sauce and sprinkled with various spices. Hitsumabushi is grilled eel (71________) a bed of rice that can be eaten in three different ways. Tenmusu is a rice ball (72________) contains shrimp tempura. Kishimen is a kind (73________) flat noodle. One can feel the rich history and culture of Nagoya reflected (74________) any of these dishes. To Nagoya, it is approximately one hour and 40 minutes (75________) Tokyo, or about 50 minutes from Osaka on the Tokaido Shinkansen. You can also fly (76________) the Chubu International airport, from which it takes roughly 30 minutes to get to Nagoya Station (77________) train. and to the east by the Shikoku Mountains one of the highest mountain ranges ( 2 ) western Japan. and is blessed with a warm and mild climate. Matsuyama Castle is the symbol of the city and is located ( 4 ) its center. you can enjoy views ( 7 ) the city, the mountains and the sea. You can take a cable car or a lift to the top ( 8 ) the mountain. Matsuyama Castle is the largest castle ( 9 ) Shikoku. and is one of only 12 such castles that remain( in )Japan today. The keep offers ( 11 ) 360-degree panoramic view. Within the castle you can try ( 12 ) a suit of armor, an attraction which is popular among tourists. into modern nation ( 15 ) the Meiji period. As well as dealing ( 16 ) the Meiji period, the museum has exhibits that retrace the steps ( 17 ) the novel’s characters – Yoshi Akiyama furu, Saneyuki Akiyama and Shiki Masaoka – in Matsuyama. sense of the passage( of )time. There are a number of sites in Matsuyama associated ( 19 ) the (aforementioned) three characters. which enable you to see how ( 22 ) three spent their childhood. are designed to match ( 24 ) the period that the novel “Saka no Ue no Kumo” is set in. Shiki Masaoka, was a great haiku poet, and brought baseball ( 25 ) Matsuyama. A famous haiku ( 28 ) Shiki is, “Kaki kueba/ Kanega narunari/ Horyuji” (Eat a persimmon/ And the bell will toll/ At Horyuji). By producing a number of haiku related ( 29 ) baseball, such as, “Mari nagete/ Mitaki hiroba ya Haru no Kusa” (Throw a ball in an open space/ To see spring grass in the field), he contributed to popularizing baseball ( 30 ) literature. you can learn ( 32 ) Matsuyama’s traditional culture and literature through such anecdotes about Shiki. Another famous figure in Matsuyama City – which is also known as the town ( 33 ) literature – besides Shiki is Soseki Natsume. Shiki and Soseki were friends who discussed haiku together. is considered to be such an influential figure, that his image was printed ( 35 ) 1,000 yen bills. city and is a work ( 37 ) deep profundity. and the “Madonna Bus,” a vintage bus( with )a front engine. The unusual sight ( 39 ) these classic vehicles driving about the modern city is refreshing and evocative ( 40 ) times gone by. a spot which can be accessed( by )riding the Botchan Ressha. and is a popular spot ( 46 ) taking commemorative photos. enabling you to take photographs in which it appears as if you had just traveled back ( 48 ) time. Once you get off at Dogo Onsen Station, you enter the world ( 49 ) Botchan. you are greeted ( 51 ) a huge red automaton clock called “Botchan Karakuri Dokei” (Botchan Automaton Clock). and the characters ( 53 ) Botchan make their appearance dancing merrily. Tour guides dressed as Botchan and Madonna are popular ( 54 ) tourists, as are rickshaws. With a history spanning over 3,000 years, Dogo Onsen is said to be the oldest hot spring ( 55 ) Japan. is one of the buildings on which “Spirited Away” – an animation film directed ( 56 ) Hayao Miyazaki – was modeled. where visitors can easily take time out ( 58 ) sightseeing by enjoying Dogo’s hot spring waters. Taking a footbath is the best way to rest your legs after walking ( 59 ) Dogo. we recommend a pot of nabeyaki udon, a specialty ( 61 ) Matsuyama. Served in the pot in which it has been cooked, nabeyaki udon features a rather sweet soup peculiar ( 62 ) Matsuyama. Cooked ( 63 ) a pot for one person, the noodles absorb the flavor well. A little soft an ( 64 ) koshi (firmness or elasticity), these udon are also called “koshinuke udon” (koshi-less udon). Matsuyama is a city in which the old, in the form ( 65 ) hot springs, a castle and classic literature, co-exists ( 66 ) the modern. Traditional crafts that have been passed down ( 67 ) the generations are still practiced today. and “Tobe-yaki” a kind of pottery which has its roots in Tobe-cho in the southern part ( 69 ) Matsuyama City. you can experience these crafts and make an item that is the only one of its kind ( 70 ) the world. The flight to Matsuyama from Haneda Airport ( 71 ) Tokyo takes about one and a half hours. it takes about six hours and ten minutes. 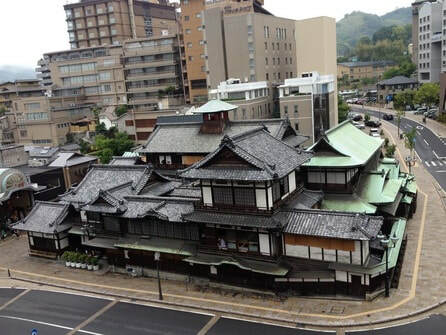 Matsuyama Castle and Dogo Onsen are ten to 20 minutes’ drive ( 73 ) the airport and the station. The Botchan Train is available ( 74 ) traveling between major tourist spots. Clear blue skies, vivid green meadows, majestic mountains, and a sea so transparent that you can see down (1 ) the rocks below – Kumamoto Prefecture, located (2 ) the center of Kyushu, south-west Japan, is blessed with an abundance (3 ) beautiful natural scenery. It also boasts a number (4 ) historical spots including Kumamoto Castle, built (5 ) the Edo period, as well as numerous unique hot springs like Kurokawa Onsen. Kumamoto’s famous Mount Aso is actually a gigantic caldera (volcanic crater) that encloses five peaks called “Aso-Gogaku.” Within these peaks lie craters which were formed (6 ) subsequent volcanic activity. These include Naka-Dake (Mt. Naka), an active volcano. The caldera is one of the largest (7 ) the world and inside it are fields and houses inhabited (8 ) people. To fully enjoy the magnificent view (9 ) this Aso mountain range, a visit to Daikanbo Peak (10 ) the north of the caldera’s rim is recommended. Here, those (11 ) the middle of a long motorbike ride or a drive can take a little break to gaze out (12 ) the spectacular view of the Aso-Gogaku mountains, and the caldera. You can also enjoy the stunning vistas of Aso (13 ) going horse riding in Kusasenrigahama, a vast meadow (14 ) the foot of Eboshi-Dake (Mt. Eboshi) near Naka-Dake. There are quite a few hot spring resorts (15 ) the vicinity of Aso, most notably Kurokawa Onsen, which is famous nationwide. This hot spring resort is characterized (16 ) its open-air baths, each one unique to each inn. You can enjoy any of these outdoor baths (17 ) booking a room in the inns that operate them by simply paying a small fee (18 ) the door. Another popular thing to do is to take a walk (19 ) the rows of restaurants and souvenir shops that line the town’s streets. Kumamoto is also well known (20 ) the Amakusa Sea. The view of green islands of various sizes floating (21 ) the blue ocean is spectacular. The scenic roads (22 ) Amakusa-Gokyo – the five bridges connecting the islands – are a popular route with those wanting to take(23 ) the superb view. In addition to its beautiful blue sky and sea, the sight (24 ) the sinking sun in Amakusa is splendid too. Seen from the west coast, the way the evening sun sets slowly (25 ) the horizon is mystical and breathtaking. The picturesque sea (26 ) Amakusa has beautiful white sand beaches which become crowded (27 ) summer with people who come to swim. Watching wild schools of dolphins (28 ) a boat is another popular activity. The dolphins are so friendly that you can even see them swimming (29 ) the boat. You can also try scuba diving to get an enjoyable look (30 ) coral reefs and tropical fish. Kumamoto Prefecture has an abundance (31 ) historical sites. A typical example is Kumamoto Castle (32 ) Kumamoto City. Built (33 ) the Edo period, this castle, overlooking downtown Kumamoto has characteristic stone walls which were designed to become steeper the higher up enemies tried to climb – by the top they are almost vertical. 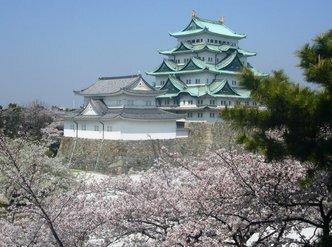 (34 ) the cherry blossom season in spring, the contrast of beautiful flowers (35 ) the austere castle attracts crowds of sightseers. In Kumamoto City trams run (36 ) the streets. Getting on a tram from the nearest stop (37 ) Kumamoto Castle – Kumamoto- Jo/Shiyakusho-mae (Kumamoto Castle/City Hall) – and getting off (38 ) Suizenji-Koen (Suizenji Park) about 15 minutes later, you will find Suizenji Jojuen (Suizenji Garden) (39 ) the park’s grounds. With a pond as its center, the garden, built (40 ) the Edo period, consists of hills, stones, lawns, and plants, whose arrangement imitates famous landscapes found elsewhere (41 ) Japan. Along with Kumamoto Castle, the garden attracts a number (42 ) tourists. Kumamoto also boasts a variety (43 ) delicious dishes. Kumamoto ramen is especially famous nationwide. There is another famous kind of ramen (44 ) Kyushu, this is called Hakanta ramen and is found (45 ) Fukuoka, but the tonkotsu soup (pork bone soup) of Kumamoto ramen is richer than that (46 ) Hakata ramen and the noodles are thicker and have more elasticity. It is characteristically eaten (47 ) garlic chips which are made by deep-frying or with oil made (48 ) deep-fried garlic. Its natural bounty has made Kumamoto one of the largest agricultural prefectures (49 ) Japan. Tomatoes are grown all year round and watermelons have long been cultivated here making it one (50 ) the biggest fruit producing regions in the country. Many citrus fruits, such as the mandarin orange, are also farmed (51 ) Kumamoto. There are a wide variety (52 ) them available, including dekopon, a type of sweet juicy orange characterized (53 ) a distinctive raised knob on its top. Banpeiyu, which can grow (54 ) the size of a human head, is another famous citrus fruit produced (55 ) Kumamoto. In addition to its extraordinary size, its charm lies (56 ) its crisp, elegant flagrance and refreshing sweetness. Because the fruit lasts a long time, you may choose to place it (57 ) a room to enjoy its aroma for a while (58 ) eating it. The thick white part (59 ) the skin and the pulp can be candied to make it edible. It takes (60 ) one hour and 30 minutes to fly to Kumamoto Airport from Haneda Airport in Tokyo. Also, using the Kyushu Shinkansen, which opened (61 ) its entirety in March 2011, allows you to get to Kumamoto Station from Hakata Station in Fukuoka (62 ) 33 minutes. Many Japanese people associate Kanazawa, Ishikawa Prefecture (1______) the phrase, "Kaga hyakuman goku." 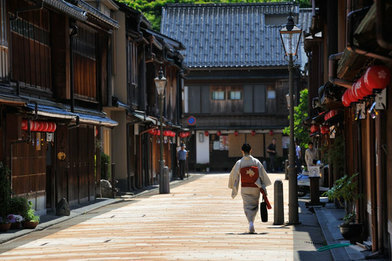 Used up until the Edo period, Kaga is the old name (2______) Kanazawa and the surrounding area. One koku is the amount of rice consumed (3______) the average adult in a year, and hyakuman goku is a million times that amount. (4______) phrase shows just hour rich and agriculture area Kanazawa was. This expression, used (5______) the samurai ear, is still the city’s catch phrase. It indicates that Kanazawa is a famous castle torn (a town that thrived (6______) a castle). To get around the city, it’ s convenient to use sightseeing buses called "Jokamachi Kanazawa Shuju Bus" available (7 ______) JR Kanazawa Station. There are three different buses named after three (8______)Kanazawa’s famous literary masters: Kyoka, Saise, and Shusei. In Higashi Chayagai (East Teahouse District), rows of houses (9______) the Edo period still remain to this day, making it a popular spot (10______) non-Japanese tourists as well. The district was established when the Kaga Domain, which governed Kanazawa (11______) the Edo period, assembled and maintained ochaya teahouses (eating establishments where geisha entertained customers (12______) playing traditional musical instruments such as the koto and shamisen and (13______) performing dances) in the area. In addition (14______) the teahouses that have been in business since the old days, unique restaurants, cafes, general stores and ryokan (Japanese-style inns) stand side (15______) side. In Higashi Chayagai, there are some general stores which deal (16______) gold leaf. Gold leaf is gold that has been beaten repeatedly (17______) a sheet thinner than a piece of paper. It’s one of the traditional crafts in Kanazawa made (18______) the same method that has been passed down (19______) the ages. If gold leaf were made using only gold, it would be too soft, so it’s mixed (20______)small amounts of silver or copper. Initially encouraged by the Kaga Domain, nearly all gold leaf production (21______) Japan is now based in Kanazawa. Because there’s an East Teahouse District, it follows that there’s also (22______) West Teahouse District. Nishi Chayagai is adjacent to an area (23______) many temples. The most famous (24______) those temples is Myoryuji Temple. With a number of architectural tricks (25______) place to deceive intruders – such as trap doors, hidden staircases and rooms – it’s been nicknamed the “Ninja Temple.” What’s more, the temple looks like a two-story building (26______) the outside, but once inside, you discover it has four floors. To the south west (27______) Higashi Chaya-gai is Kenroku-en, the most famous tourist spot in Kanazawa. Not only is it well-known (28______) Kanazawa, but it’s one of the most famous gardens (29______) Japan . Originally a “daimyo teien” a garden built by feudal lords in the Edo period (30______) their personal pleasure – now that the daimyo are a thing (31______) the past, Kenroku-en is open to the public. A common sight in Kenrokuen (32______) winter is yukitsuri: branches tied together with rope in order to prevent them from breaking (33______) the weight of fallen snow. Right next (34______) Kenroku-en is Kanazawa Castle Park. These are the ruins of the castle previously owned (35______) the Maeda family, who used to be the rulers (36______) the Kaga Domain. Its gates and turret (a part of the castle built to watch for enemies and defend (37______) attack) have been restored to look as they did in the Edo period. Based (38______) old plans, pictures and documents, as well as (39______)research findings, they were reproduced, down to the last detail according (40______) the original construction techniques. Preserved (41______) the Edo-period, Ishikawa-mon is a gate leading from Kenroku-en to Kanazawa Castle Park. Since the gate is the oldest structure (42______) the park and looks so magnificent, many people mistakenly believe that it’s the otemon (the front gate), but it’s actually the karamete-mon (the rear gate). The karamete-mon is the gate used (43______) the lord to escape from the castle in case it becomes impossible to defend (44______) an enemy attack, and it’s designed in such a way that it can be guarded (45______) a small group of people. Near Minami-cho, a business district (53______) Kanazawa, is the Oyama Shrine. This shrine has a rare feature not seen in any other shrine (54______) Japan: stained glass is used for the windows (55______) the top part of its shin-mon (main gate). The lightening rod standing (56______) its rooftop is also unique to this shrine. The shin-mon is lit (57______) at night. Oyama Shrine is dedicated (58______) Toshiie Maeda – the first lord and founder of the Kaga Domain – and his wife Matsu. In the grounds (59______) the shrine you can find a bronze statue of young Toshiie. Riding (60______) his horse, a cloak hanging from his back swells in the wind. This cloak is called a horo and is intended to protect its wearer (61______) arrows shot from behind. As it stands out (62______) the battlefield, the cloak is only worn by samurai that are considered skilled (63______) their master and as such, wearing one is a mark (64______) honor. Omi-cho Ichiba, north of Oyama Shrine, is the most famous market (65______) Kanazawa. There you can find eating and drinking establishments, many of which serve sushi made (66______) fresh seafood. A fish unique (67______) Kanazawa is nodoguro (literally translated as “black throat”). It is an expensive fish, and the inside (68______) its mouth is black, as its name suggests. Snow crabs are well-known as a winter delicacy (69______) Kanazawa. To get (70______) Kanazawa, it is convenient to use Komatsu Airport. Buses go directly (71______) the airport to JR Kanazawa Station, and if you take an express bus, you will arrive (72______) the station in about 40 minutes. Incidentally, Komatsu City, where this airport is located, is the birthplace (73______) Komatsu Ltd., a world-famous company which manufactures heavy machinery.